If you’ve been wanting an adorable bag, big enough to fit everything you need and some more, look no further. 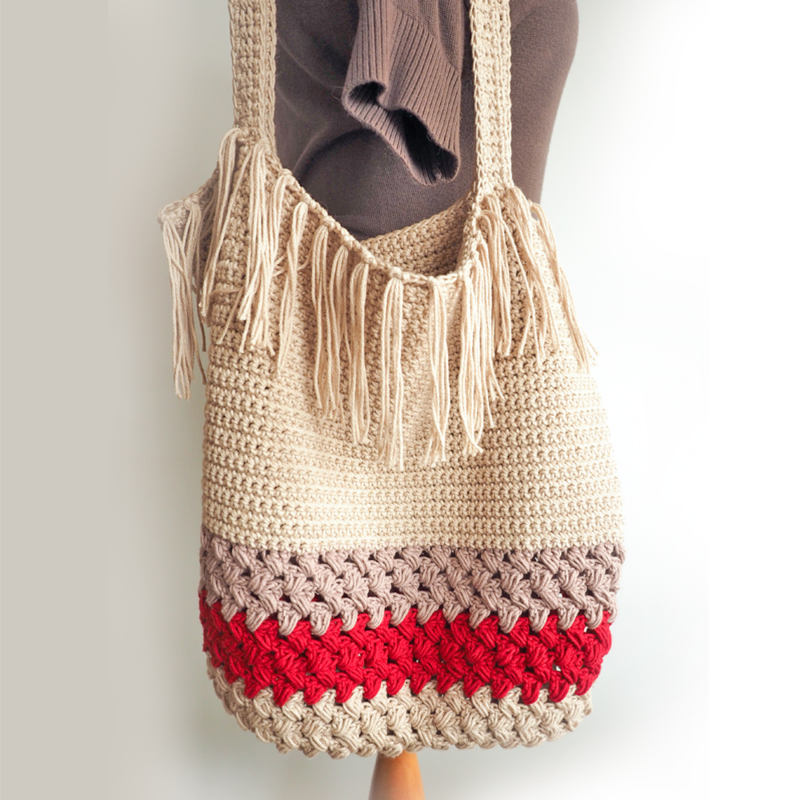 The Fringe Shopping Bag is roomy enough to hold all of your groceries or your entire wardrobe. 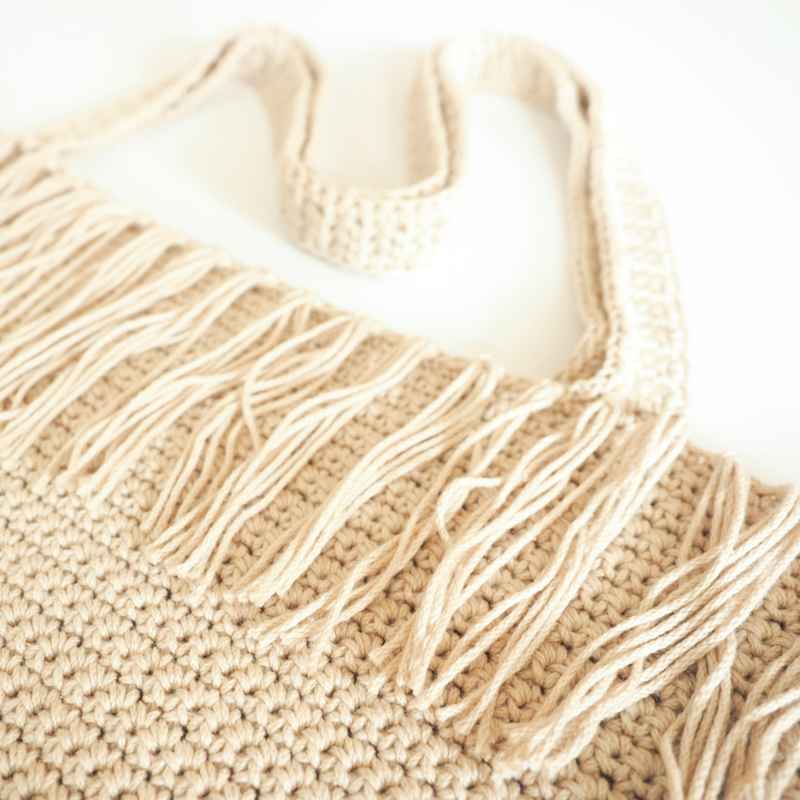 This Fringe Purse is so spacious and it’s incredibly stylish. Everyone at the store will be asking you where to get one. The elements of this pattern really work together to make this a one of a kind piece. The fringe detailing that lines the top of the bag really makes it stand out. This Fringe Purse makes a statement, and is sure to be the IT bag of the season. 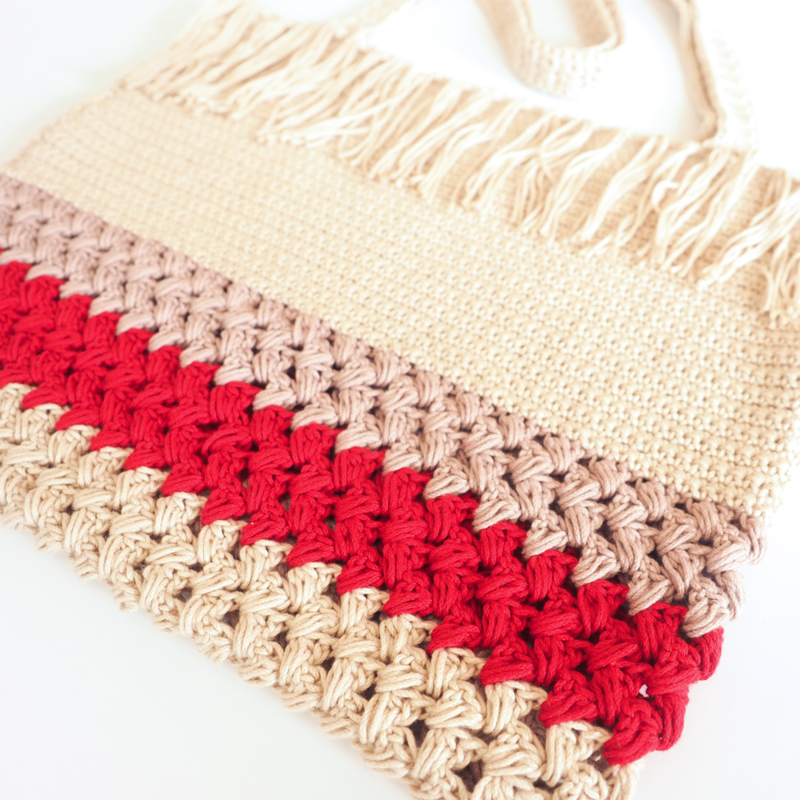 It’s so versatile and can be used as anything, from a grocery bag to a gym bag. And because it’s so sturdy, it will last you a long time. See for yourself! 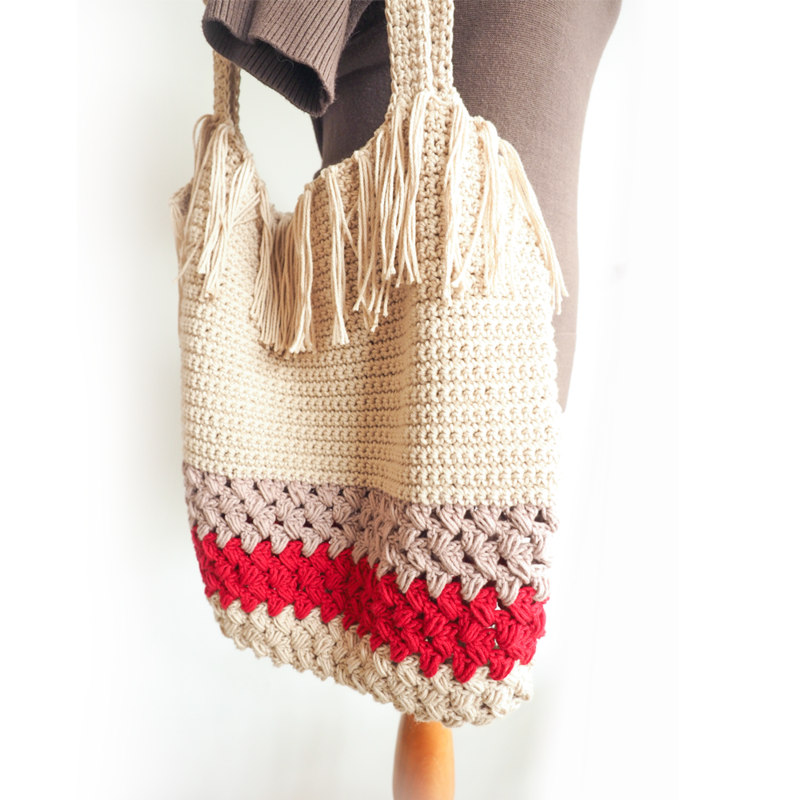 Check out the crochet kit I put together for this bag so you can start making it today. It’s got everything you need to complete this amazing project. 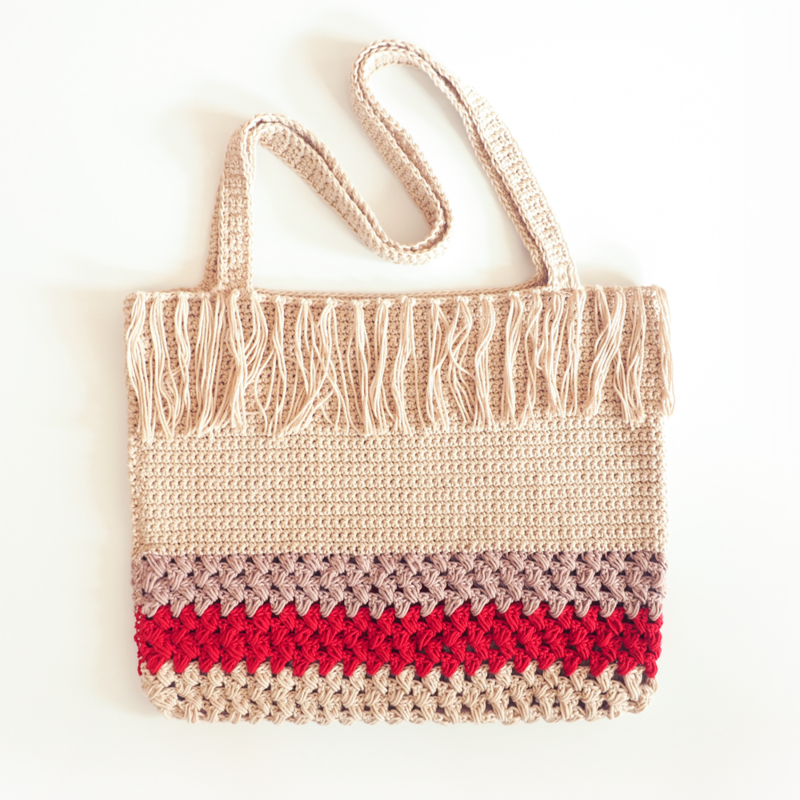 Every kit includes a digital PDF pattern that walks you step by step through the project, and every skein of yarn needed to make this bag. It’s a purchase you can feel good about since you’re supporting small business owners who are passionate makers, just like you. 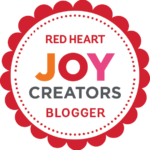 I love being a part of such a supportive, creative community and I would love for you to be a part of that community too. Puff Stitch – YO, insert hook into designated stitch, YO and pull up a loop. YO, insert hook into the same stitch, YO and pull up a loop. YO, insert hook into the same stitch, YO and pull up a loop. YO, and pull through all seven loops. Chain one. Repeat pattern to make the other side of the bag. Whip stitch together along the sides and bottom; turn project right side out. Row 1: Sc into each of the next 3 sts. Ch 1, turn. Repeat row 1 until handle is 28” long. Cut yarn and tie off; count 12 sts from the other side of the bag and whip stitch on to the next 3 sts; repeat for the other side. Sc around the handles and top of bag. Cut 3 strands of yarn approx 12” each. Fold yarn in half and use your crochet hook to pull top of fringe through top of sc. Pull ends of yarn through and pull tight to create a knot. Repeat around the top of the bag, placing fringe every 3 sts. Trim ends 5.5”. I hope you’re as excited about the Fringe Shopping Bag as we are. It’s perfect for making a run to the grocery store. Or make one as a gift for an expecting mother. 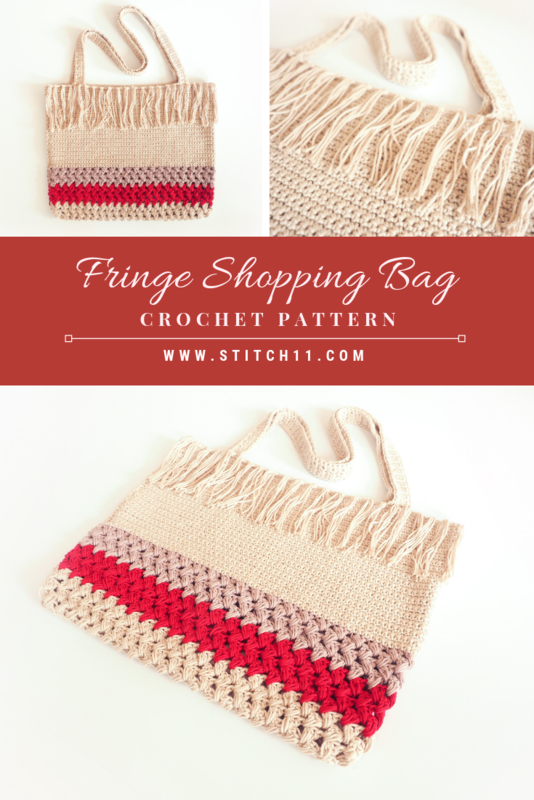 This Fringe Purse would make a beautiful baby bag. Whatever your plans are for this project, it is sure to become an instant hit. Just prepare yourself for all the people who will be begging you to make them one too! But don’t worry, we’ve made it easy for you to make as many as you need with our special kit. With easy access to the digital pattern and the soft quality yarn, you’ll be making Fringe Bags without ever breaking a sweat.